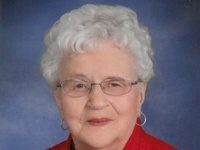 Funeral services for Arlet Olson, 94, of Karlstad, MN, and formerly of Lake Bronson will be held at 10 A.M. Thur., April 11, at the Community Covenant Church in Lake Bronson with Pastor Paul Olson and Pastor Dave Ingraham officiating. 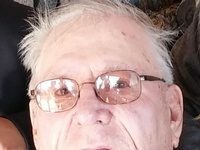 Visitation will be after 6 P.M. Wed. with a 7 P.M. prayer service at Collins Funeral Chapel in Karlstad and at the church one hour prior to services Thur. morning. Burial will be in Riverside Cemetery in Lake Bronson. Arlet Genevieve Olson, the daughter of the late Genevieve (Ready) and Glen James Measel, Sr., was born on Dec. 6, 1924, at Holly, Michigan. The family later moved to Deadwood in the Black Hills of South Dakota where Arlet grew to womanhood. 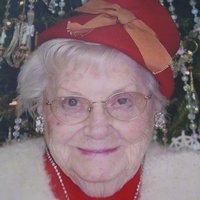 On March 6, 1949, she was united in marriage to Harvey Olson at Strandquist, MN. Following Harvey’s discharge from the service in 1963, the couple moved to Lake Bronson where they made their home for many years. Harvey passed away Sept. 6, 2002, and Arlet continued her home at Lake Bronson. 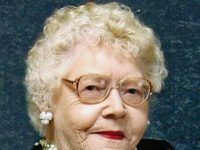 Since Sept. of 2007, she has resided at the Karlstad Senior Living Center in Karlstad where she passed away on Sat., April 6, 2019, at the age of 94 years and four months. She is survived by two daughters: Patti (Rick) Sele, of Lake Bronson and Rita Larson, of Karlstad; three sons: Pastor Paul (Carol) Olson, Callaway, Nebraska; Curtis (Amy Norberg) of Lake Bronson; and Terry Olson, of Thief River Falls, Minnesota; 14 grandchildren; 33 great-grandchildren; 11 great-great-grandchildren; one sister: Avis Watts, of Conway, South Carolina; in addition to many nieces, nephews and other relatives. Arlet was preceded in death by her husband, her parents, two brothers and three sisters.